The 39th Brian Wilson/Beach Boys Stomp Convention. Tickets;- Although there has been some thought with an increase it has been decided to hold the advance purchase price to £20-00. After the 26th August the price becomes £25-00, as will be the price on the day. With your application you should include a self stamped addressed envelope to a minimum size of 8.5in by 4.5in and all envelopes should include a stamp to the ‘Large Letter’ size. This is due to the fact with the badge included the thickness exceeds 5 millimetre. Cheques made payable to ‘Beach Boys Stomp’, Please? 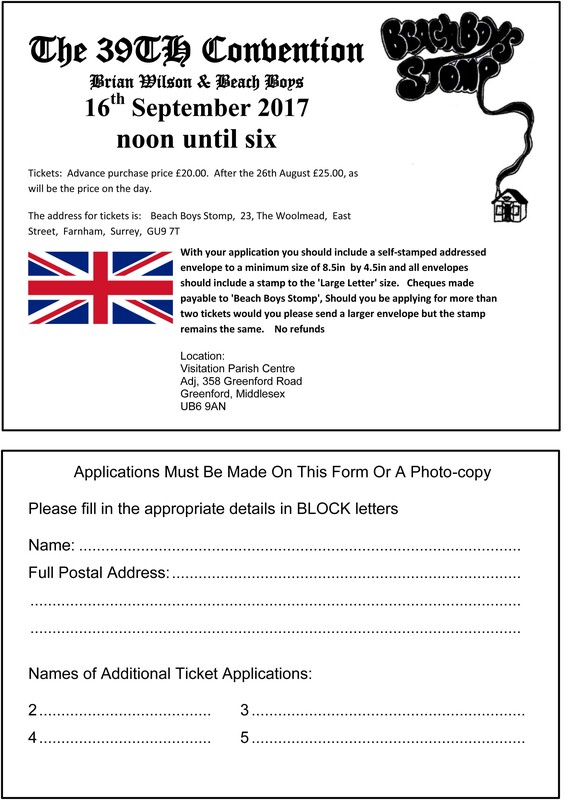 Should you be applying for more than two tickets would you please send a larger envelope but the stamp remains the same. The address for tickets is;- Beach Boys Stomp, 23, The Woolmead, East Street, Farnham, Surrey, GU9 7TT. ‘Special Guest’;- As was mentioned at last years event we are able to now confirm the ‘Special Guest’ is Mrs. Ginger Blake who will be here with her husband, whom has in fact not visited Britain before. As you will all be aware Mrs. Blake was one of ‘The Honey’s’ and has been at close quarters to observe ‘The Beach Boys’ for a great many years and of course the Californian music as well. Roy Gudge Friday 31st March 2017.